The underlying pharmacological mechanisms of mephedrone, especially as related to interactions with different neurotransmitter systems, are a critical area of study as mephedrone continues to be abused. Direct-acting 5-HT2A/2C receptor agonists and antagonists and D1–3 receptor antagonists were examined in two groups of rats trained to discriminate mephedrone. A high dose of mephedrone was trained to extend previous results with traditional monoamine transporter inhibitors and substrate releasers. 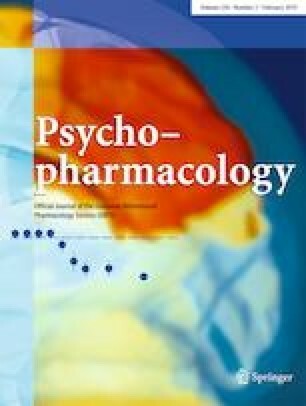 A very low dose of mephedrone was trained to preferentially capture serotonergic activity and to minimize the influence of rate-decreasing effects on substitution patterns. Selective 5-HT2A/2C and D1–3 receptor antagonists were examined in both groups. Male Sprague-Dawley rats were trained to discriminate either a low dose of 0.5 mg/kg mephedrone (N = 24) or a high dose of 3.2 mg/kg mephedrone (N = 11) from saline. In the low training-dose group, mephedrone, MDMA, methamphetamine, d-amphetamine, cocaine, and enantiomers of mephedrone substituted for mephedrone; mCPP partially substituted overall for mephedrone; and DOI, WAY163909, and morphine failed to substitute for mephedrone. In the high training-dose group, only mephedrone and MDMA substituted for mephedrone. Sulpiride produced a small antagonism of the low training dose of mephedrone while SCH23390, SB242084, and ketanserin altered response rates. A lower training dose of mephedrone produces a discriminative stimulus fully mimicked by MDMA, methamphetamine, cocaine, and d-amphetamine, whereas a higher training dose of mephedrone requires a discriminative stimulus that was only mimicked by MDMA. Dopaminergic or serotoninergic antagonists failed to produce significant blockade of mephedrone at either training dose. This project was conducted in partial fulfillment of the doctorate degree in Pharmaceutical Sciences at Temple University for Iman Saber. The authors wish to thank Drs. Ellen Unterwald and Sara Jane Ward for their intellectual contributions and initial readings of this manuscript. Funding sources: R21DA032718, R01DA039139 and P30 DA013429-16.